The origins of pane pizza is unknown. What can be told about Mario’s version of it is that this recipe is one he grew up with as a last minute or “clean out the fridge” style dish that has been used time and time again for dinners, entertaining and to curb pizza cravings. 2. Place the tomatoes into a bowl and add the oregano, salt, pepper and a good drizzle of olive oil, to taste. 3. Mix well and crush, leaving some chunky pieces of tomato still present. 4. Slice bread evenly and place on a baking tray. 5. Dress bread with sauce, spreading evenly. Add toppings and finish with cheese. 6. Bake in oven for about 5 – 10 minutes until the cheese has melted and the bread is crunchy, but making sure not to burn either the bread or the cheese. – Like with all pizza, toppings are a personal preference. However to keep it authentic, it is best to adopt a less is more approach. 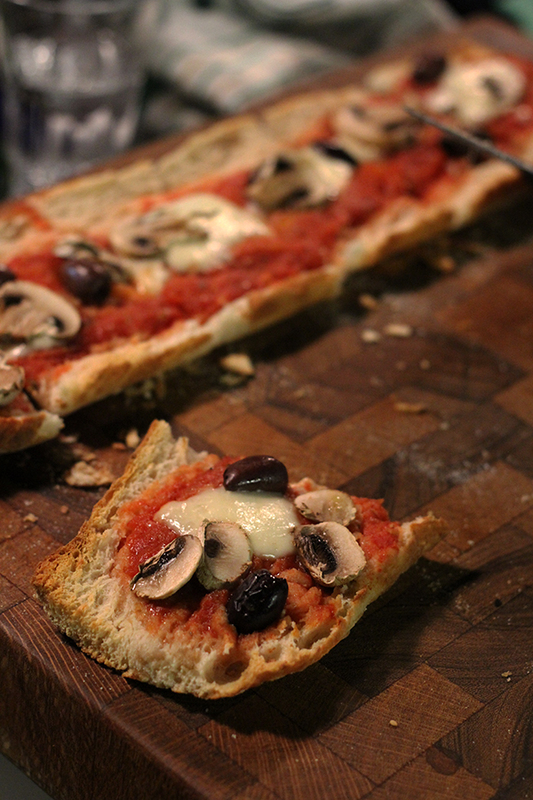 – Whilst the pizza sauce and bread slices can be prepared ahead of time, it is best to top the bread and serve at the last minute.